The advisory board of the Central Albany Revitalization Area talked about this at their last meeting, on Sept. 18. They reviewed three recommendations from Kate Porsche, the urban renewal and economic development director, for what should go in the middle island of the circle: Some kind of art, a lighted sign, or just landscaping. How about some kind of low profile landscaping. The last thing needed is something to distract your attention while attempting to enter this thing with traffic. If you’re looking at the other side of a modern roundabout when you’re entering, you’re driving unsafely. Drivers entering a modern roundabout should first look for pedestrians, then watch for other motorists coming from the left and then watch for pedestrians when exiting. The motorist on the other side of the circle won’t get to you for 5 or ten seconds. Obscured views across the central island is one of the safety features. Well, that’s actually pretty disappointing. I really like this new round-about but it presents a unique opportunity that shouldn’t be missed. Bend has well over 30 traffic circles and every one contains a significant piece of public art. Some might be controversial, such as the piece locllay known as the “flaming chicken”, but even it serves as a directional guide (“take the second exit past the flaming chicken”) and it has been replicated on local beer labels and other Bend promotions. For a city of 50,000, Albany has a public art deficiency. Peter Kageyama, a renowned speaker and author on the subject of “loveable cities”, argues persuasively for the expanded use of public art as a highly effective means to help citizens feel better about where they live and to promote their home towns to others. Albany’s carousel project is a good example of that phenomenon, but we need more, especially on the east side of downtown which could use something to love, or at least something to talk about. Well, if BEND does something then we must copy it? I remember when Bend was a nice little town and I spent much of the ’80’s there…before it got CALIFORNICATED. I’ll take my chances here, thank you. I wonder if Mr. Bryant approves of using CARA funds for his “artwork”? 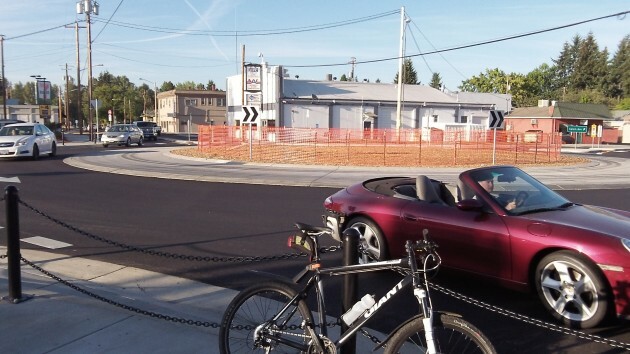 CARA seems to have all kinds of money for art, benches, and sidewalks with bioswales…..but a mere $1.4 mil for something that would benefit all of Albany…..a new fire station downtown. Shameful if you ask me. Who laid all that rubber down just outside that orange thing? It looks like someone decided to use the inner circle as a race track. Modern roundabouts are designed for trucks and trailer towing vehicles by including the center flat area around the circle. It’s not a sidewalk, it’s called a truck apron, and it’s for trucks to begin a sharp right or end a left or U-turn on. Rats! And I thought the cool-looking orange net fencing was their decision. Its every bit as artistic as a lot of the “public art” thats been perpetrated on the public. A little landscaping would be nice public art wouldn’t it? Just a suggestion… employ the KISS method when creating it. I agree that there shouldn’t be anything distracting. Riding my bicycle through it and having the bike lane “DISAPPEAR” is distracting enough. The less confident cyclist should be provided a ramp to exit the street and use a shared use path around the roundabout. Such paths are at least ten feet wide (4 m) and cyclist operate at low speeds, crossing at the pedestrian crossings. http://tinyurl.com/roundabouts-and-bikes Sometimes space constraints, as with other intersection types, limit ideal design. Thanks for this giant mass of information on roundabouts around the world. Interesting, to say the least, to a transportation nut like me and, I’m sure, many of the readers of hh-Today.